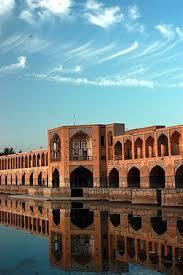 Khaju Bridge was built by Shah Abbas II in about 1650. It has 133m length, 12m width and 21 arches and regulates the water flow. In the middle of the bridge, there is an octagonal residence in which Shah Abbas II hosted its guests and also watched different ceremonies and competitions with the royal family and guests. Khaju Bridge is believed to be (one of the) most beautiful bridge(s) in Isfahan and an architectural masterpiece of Safavid era.